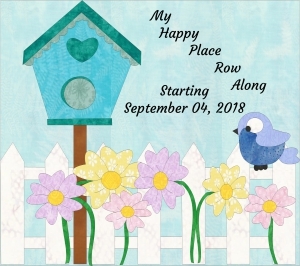 This Fall I've been fortunate to participate in the My Happy Place Row along hosted by Seams to Be Sew. The winner from my rowalong was Vivian O - congratulations! Today bloggers who participated were also invited to share rows they made that were designed by other bloggers. 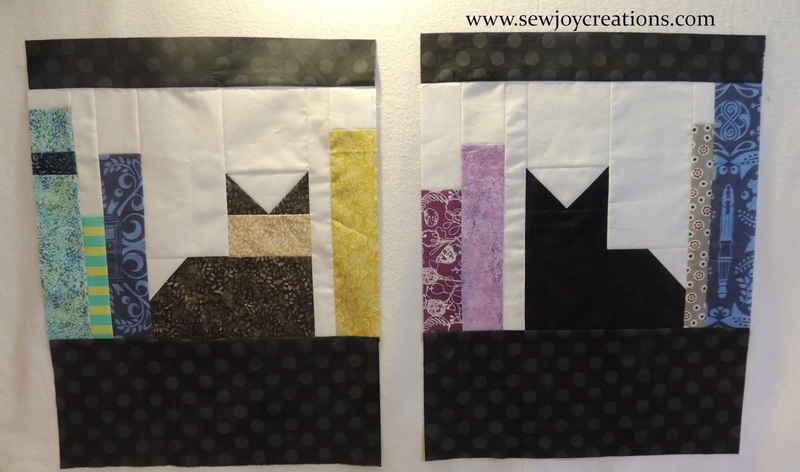 I made the cats and books row designed by Beth Strand. I got creative and wondered if I could turn the row into a basket! 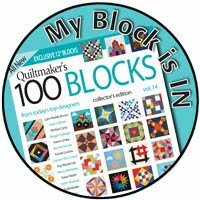 I took the row apart at the 16 1/2" mark and added another book to make two sections 12 1/2" x 16 1/2". 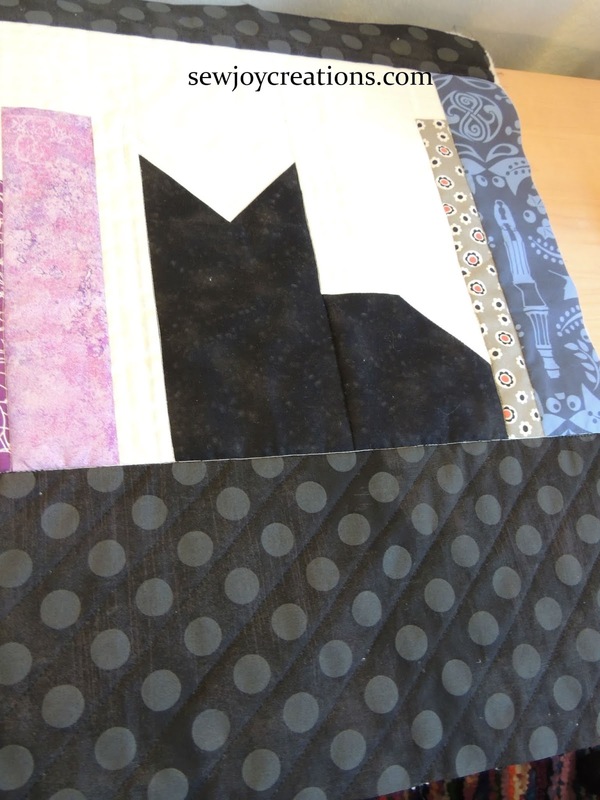 Then I added 2 1/2" strip of black polka dot fabric along each top and a 7" x 16 1/2" rectangle to the bottom of each section. I made a lining for the basket using some leftover wide backing material - 2 pieces 16 1/2" wide by 21" tall. 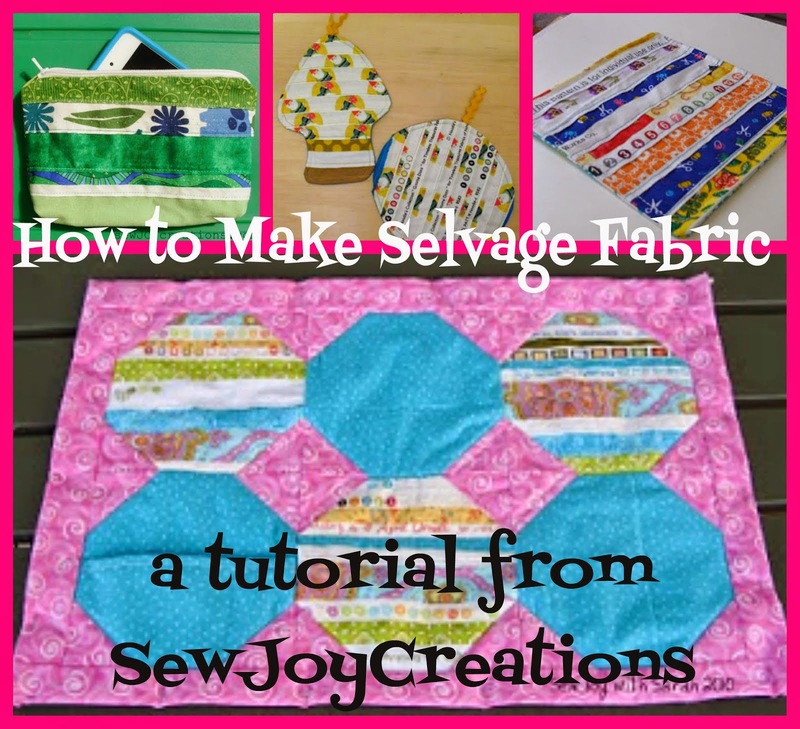 I sewed them together leaving the top untouched and a sewing gap in the middle bottom edge of 3" wide. Then I boxed the corners at 5" - originally I tried 3" but then it would have turned out more like a tote bag- which is definitely another option for turning a single row into something useful! 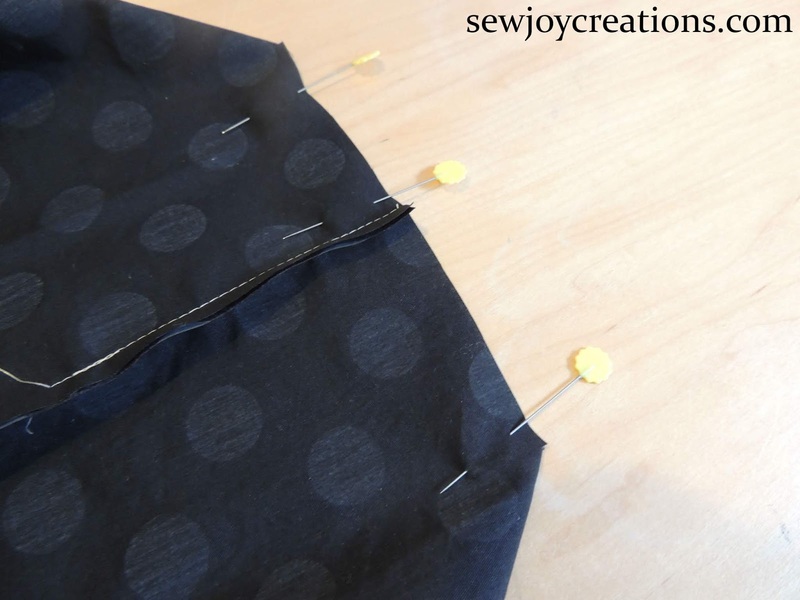 To complete the corner, separate the two pieces of the lining at the inner cut corner and make into a straight edge with the seams nesting in the middle of the edge; sew along the edge to join the sides together. I quilted both panels. I echo quilted around the cats and did several rows of stitches at the top of the row section. Then I switched to black thread and quilted on the diagonal between the polka dots on the bottom section; for the top I stitched in the ditch between the row and the added strip, then added one more row of stitches. 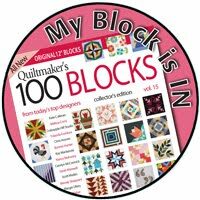 Once happy with the quilting I pinned the sections right sides together and sewed them together down both sides and across the bottom, starting from the top of one side and going all the way around to the top of the other leaving no turning gap. Now it's time to box the corners at 5" again - the same as the lining. 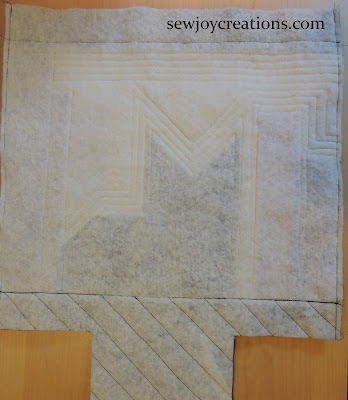 Turn the lining right side out and place inside the sewn together quilted sections that are still right side in. Pin around the top edge and sew all the way around leaving a turning gap. Now turn all of the parts through the turning gap. 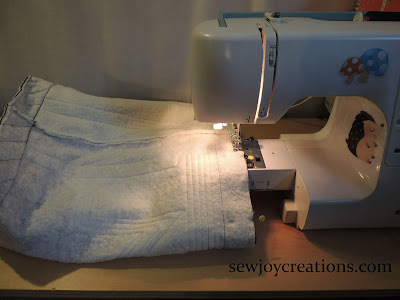 When I did this I found one of my seams wasn't great and had a hole so I pushed it back through and resewed it. 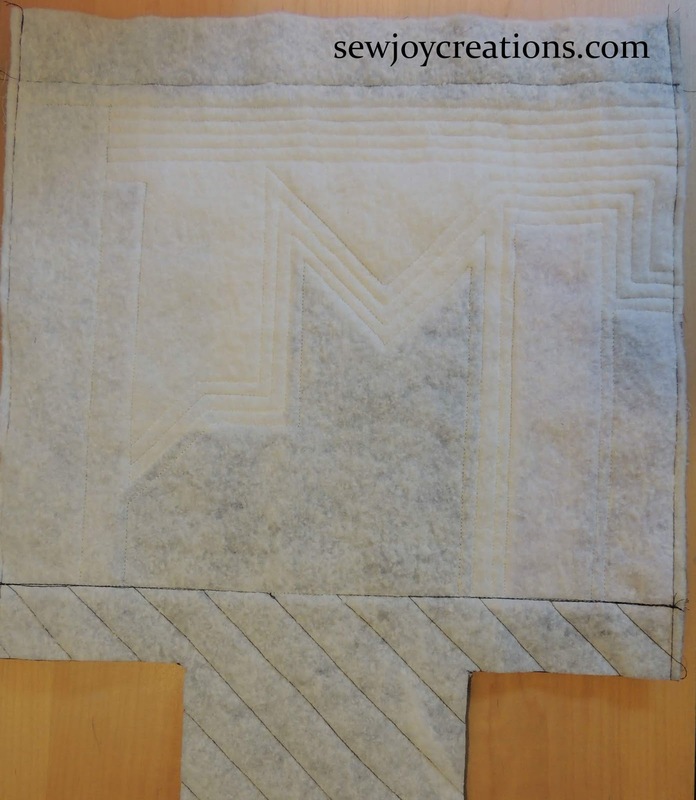 Check to make sure you're happy with all of your seams, then push the corners out of the quilted section and push the lining down into the basket. I rolled the top seam edge where the lining and quilted sections are joined between my fingers to make it flat - you could iron it flat. Then I pinned around the top edge before doing a 1/4" top stitch around it. I tried to get fancy and stitch the lining into the basket as well, but it bunched up so I took the stitches out. Thanks for sharing this fabulous row Beth Strand! I hope you enjoyed this row turned quilted basket and maybe you'll make one of your own, or use a row you have already completed. There's a giveaway today too! The giveaway is open for 24 hours only!! 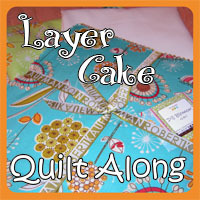 Electric Quilt is offering a coupon code for 20% off any product (excluding classes) on their site until October 23rd. This is a very awesome idea of how to use a row. Yours is particularly well suited. Thanks for sharing! What a neat idea! I would have never thought to turn any of the rows into a basket. What a super clever idea for a row. Awesome. Now that is the perfect conversion of Beth's Row. I'm sure your daughter will enjoy it for many years. That is so creative and useful. What a wonderful gift for a student (or anyone, really)! So creative in use of row! 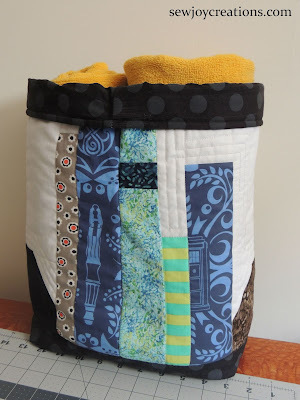 Great idea to turn a row into a basket!! Awesome. I know it will remind your daughter of home when she sees it each day. They do grow up way too fast! Thanks for sharing! What a clever idea! This could work with so many different rows; thanks for walking us through it! I love your cat basket - that is so awesome. Thank you for sharing your idea with us. What a great basket! I'll have to try doing this myself! A great way to use the row! Such a cute way to use a row! It makes me think that this row would make a great tote, too. I love cats. Very nice. 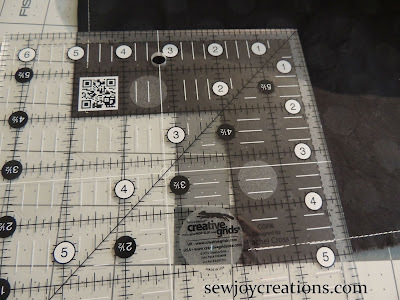 Sew clever...need to keep this concept in mind for my rows. Who doesn’t need more baskets. What a clever way to use a row! That is fabulous. I love what you did with your row. Sweet thought to have a project from home which will help in case she gets a little homesick. Plus adorable idea to create. That is such a creative way to use the rows. 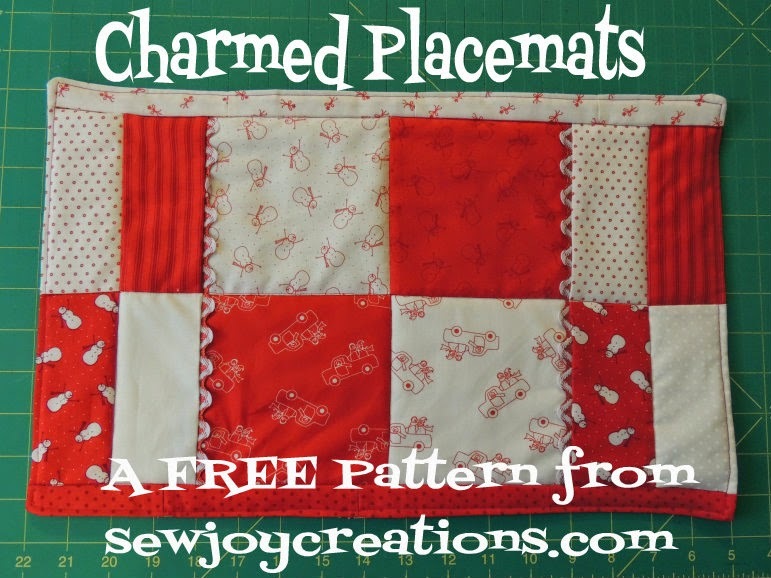 Perfect for the dorm room or a guest bath. I love it! Awesome basket! Thank you for the detailed tutorial. 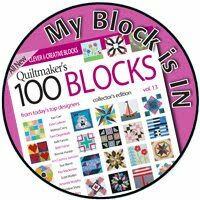 I will have to try this as it would make a great Christmas present for my daughter in law. 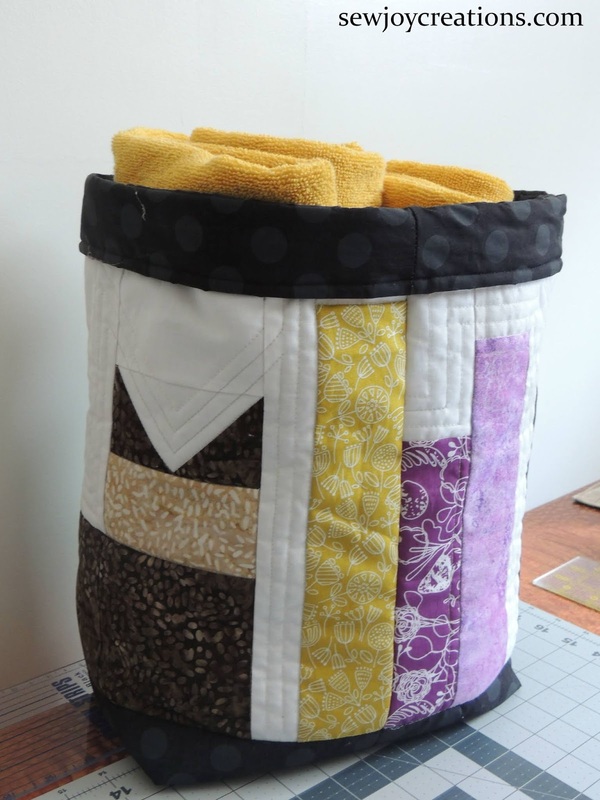 Love your pattern, and what a great idea to make it into a basket! Would be cute as a tote bag too. Thanks for sharing your pattern. I really like the basket. 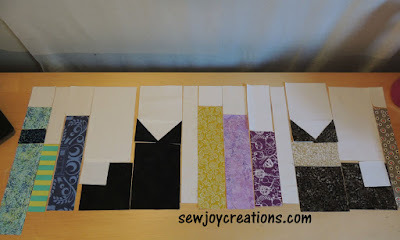 What a great idea to do with your row (which was my favorite). Too cute! These kitties make a perfect bag, and can go with you everwhere! Very cute bag, it could turn into a a great Christmas gift for someone I know! This has been a great hop! Thank you for sharing your talent with everyone. Great project! Thanks for the idea! 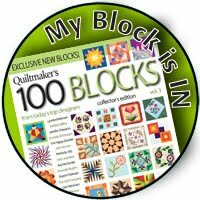 That's a neat way to use up that block. CUTE CATS! THANKS FOR SHARING! Neat idea with the cats into a basket. Hope you enjoy your empty nest. Cute basket. That's a great use for a row., Thanks for sharing. This is a great idea for using a row...love that basket! Love the way you used the tow! Thanks so much for sharing! Good idea! You do great work too. That is really a cool way of using your cute Cat row! Thank you for the tutorial! Clever setting for your row . . . purrfect for bringing books home from the library! 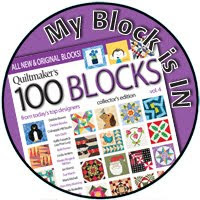 Oh, now I want to make your block and turn it into a basket too!!! Totally adorable!!! Well didn't that just turn out wonderful!!! It's just way cool... I am definitely going to have to try this, I am enamored. Great Job Sarah. Thank you for sharing this with us today. This is such a different project. You did so much planning to get it to take shape. Thank you for the great tutorial. the basket is adorable!! thanks for all the great ideas! Thanks for your ideas, and for the wonderful giveaway to participate in. Great use for the row. Thanks! Now that is just too cute! Thanks for sharing what you did.